Our passion for tea began in the late seventies when tea shops opened up everywhere in Germany. 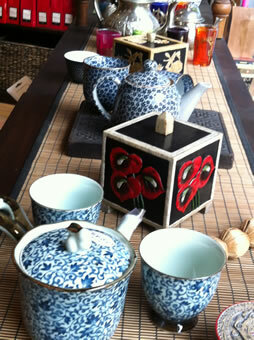 We loved the enormous variety of teas that were available and the lovely accessories to go with it. After touching down on Terra Australis on a bright Queensland day in 1982, we were slowly finding our bearings in this – for us – new world. The range of food choices available at the time took some getting used to, particularly the lack of variety and quality of tea. Determination to change this situation compelled us to start our own tea-company. We just knew there had to be others out there yearning for more than the sad-specks-of-dust passed off as tea; we searched for the real thing. And we found it. So we started importing fine teas and accessories in 1982. 1988 saw us re-locating to Hobart where we opened our first tea specialty shop in 1995 in Cat & Fiddle Arcade. More than a decade later and in true “trader” style, we, Jeffersons, are on the move again. This time to 12 Bank Arcade, facing Wellington Court, looking forward to seeing you soon! A year had almost passed since I moved and I haven’t looked back. Such a wonderful location right in the hub of the CBD. I had seen so many more new faces and I’d constantly hear from locals and tourists alike how lovely they think the new shop and location was. And then……the time came to step back a little bit. After 35 years in the Australian Tea Industry and retailing since 1995 in Hobart, we’ve left our mark and I dare to say, we have been instrumental in lifting the profile of tea in this country……many “copiers” support this….even the “big guns”. On the 24th February 2017 we closed our doors to retail and took the business ONLINE. You can call, email or go via the website……whatever you feel comfortable with……I’m looking forward to staying in contact with you “my wonderful customers” via cyber space….I will surely miss you. Send us your email address to be on the newsletter list. May the TeaForce* be with us all the time. Experience the flavours of far away places, be transported in an instant and enjoy the moment. You have now come to the place where you can enrich your life with the little things that count every day.